The above info came from Elwin Blaine Coldiron, and was edited by yours truly (contact me). The image came from JASMS. 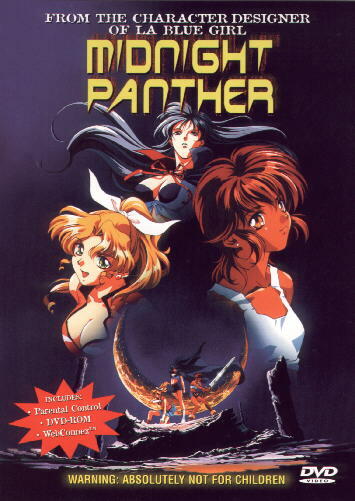 The Pussycats, a troupe of three pop singers, have a secret night job... namely the deadly assassins-for-hire named the Midnight Panther. Sonya, a sultry brunette, kills her victims by strangling them with her long hair... but not before seducing them. The blonde Rei is capable of transforming into a leopard and devouring her victims... as well as playing with them sexually. But Lukish, because of her great strength (and underdeveloped body) only seems to be good at killing the dragons their old lady manager needs for her poisons, and not the juicy assignments Sonya and Rei enjoy. However, their newest assignment changes everything. A despotic king is cruely treating the subjects of his kingdom and the Pussycats have been hired to kill him. But for Lukish it is personal... the king is her older brother who had killed her royal parents, who had disguised her as a boy so that she could assend the throne. Now Lukish is given this assignment, which means she must use her body... as well as another talent... to kill the one she cares for... and hates... the most.